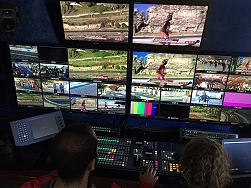 ACTAMEDYA produce the live broadcast for the Istanbul marathon. Istanbul, November 2016: Thousands of runners took part in last weekend's 38th Vodafone Istanbul Marathon which was produced for television by ACTAMEDYA. Both TRT and NTV Sport broadcast the live signal. In order to cover the three-and-a-half-hour event, ACTAMEDYA deployed a 5-camera OB van at the start of the race on 15 July Martyrs Bridge and an 8-camera OB at the finish line in Sultanahmed Square. Another 5-camera OB Van was positioned at the start of the fun run on Altunizade Bridge. In addition, eight DSNG trucks were deployed at key locations in the city and for aerial footage, the company used three helicopters and four HD drones. On the ground, cameramen on three motorcycles were used to capture close-up tracking shots of the runners. In total 46 cameras were used, and 80 team members took part in the productions to provide the marathon broadcast flawlessly. Previously, ACTAMEDYA had produced the live broadcasts of the Istanbul Marathon in 2012, 2013 and 2015. Also in 2015 and 2016, ACTAMEDYA had produced the Istanbul Half- Marathon, Adana Half- Marathon, Turkcell Gelibolu Marathon, and Samsung Intercontinental Swimming Competition. The Presidential Cycling Tour of Turkey was provided with ACTAMEDYA infrastructure.